Japan and Tokyo Guide - Cars and Motorcycles Pt 2. So you now know what I think about cars in Japan but what about motorcycles? 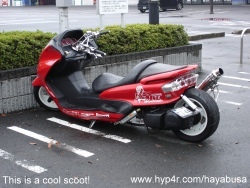 It is a commonly believed that motorcycles in particular 250cc and under are very popular in Japan and yes it is true. However you'd be hard pressed to see them en-mass unless you're a very early riser or night owl. However I didn't mention that traditional motorcycles are not as popular as once was. You see large capacity scooters have taken over! Overall motorcycles and scooters regardless of size - at least in Tokyo aren't numerous. Maybe it's the lack of parking spaces because there aren't many anyway but being the home country of all the major manufacturers you would expect more. Bicycles are the most popular choice for getting from home to the train station or work. The lager scooters are the most popular choice for getting around and you'll see them parked everywhere. Honda and Suzuki scooters are the most popular brands. Also surprisingly the most common models look very similar! The most popular models are the basic Honda Forza or Honda Fusion and the Suzuki Skywave. Also surprising was that almost all of them did not have transparent wind shields. Even in the suburbs you'd be hard pressed to see large numbers of motorcycles but they are there, just go to a motorcycle park lot to checked them all out. Late at night I started seeing a few more scooters zooming around all of them where 'pimped' or 'modded' with running lights everywhere. It was nice to see since I rarely saw any motorcycles or scooters actually being ridden on the road. Considering their brilliant public transport system its not hard see why you'd need a car, motorcycle or scooter for most daily activities in Tokyo. So don't expect to see two wheeled vehicles en-mass in Tokyo like in other Asian cities. Maybe its different outside Tokyo. Sure there's plenty around but it's not what you'd expect!